student Archives - Words Matter. In this week’s Dissertation Corner we talk to Chloe Anson about her work on a creative dissertation set in a dystopia. Join us on Tuesday 28 March to find out about our new Summer Internship Programme. 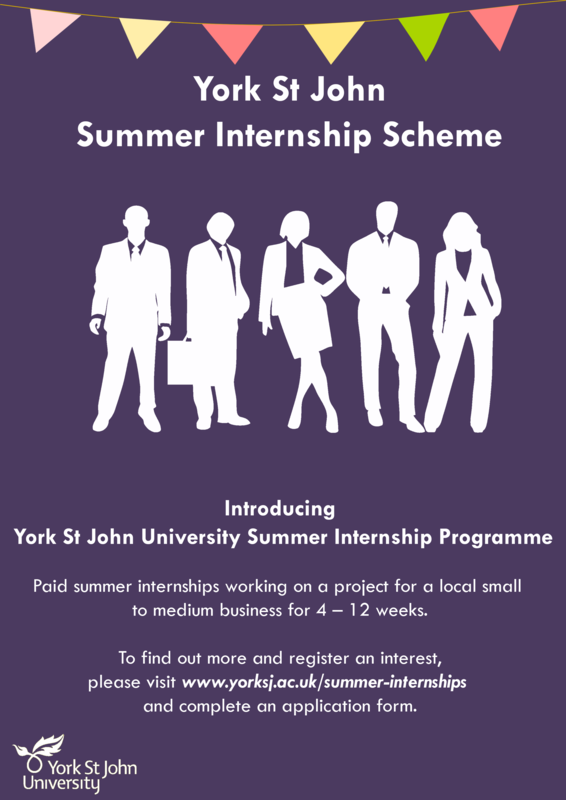 The scheme will be advertising paid summer internship opportunities exclusively available for York St John students and graduates to intern at North Yorkshire-based Small–Medium Enterprises (SME). With funding available from York St John University and in partnership with the Sodexo Aspiration Scheme, the subsidised funding will support the training allowance for York St John students or recent graduates to work as interns with small-medium-sized businesses for 4, 8 or 12 weeks full-time during the 2017 summer vacation period (June – September). The launch events will be held in our new Students’ Union Cafe. Expressions of interest from students are open now! Internships will be advertised on the York St John Jobs and Opportunities website from the 1st April with the closing date of Friday 28th April 2017. You will need to submit your CV, and a tailored cover letter online for each application you make. Follow us on social media to hear about each role as it goes live. You can find us by clicking on the links to Twitter and Facebook or by searching YSJJobsCareers. You will need to be eligible to work in the UK full-time during the internship. If you are on a visa, your visa must cover the full duration of the internship. It is the student’s responsibility to ensure they are eligible for the scheme and comply with York St John University sponsorship duties and visa regulations before submitting an application. It is the responsibility of the business to check their intern’s eligibility to work in the UK taking into account the above regulations. Internships can be anything between 4 and 12 weeks, with a starting date anytime from the 5th June 2017 ending 1st September 2017. Prepare: Register your interest now! 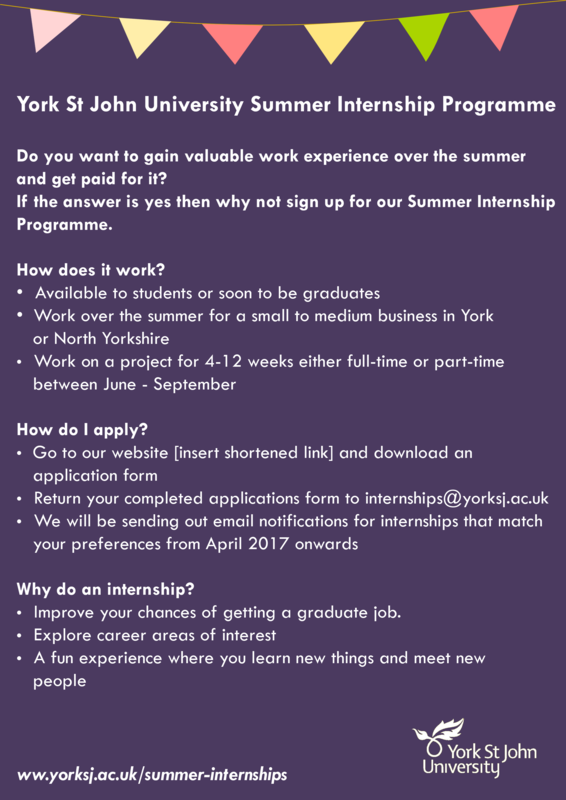 Email internships@yorksj.ac.uk with your course name, course year and preferred email address to be added onto the Student Internship mailing list. Keep an eye out for our CV and Interview workshops as advertised on the Jobs and Careers webpage. Keep a look out for more information about our Leaver’s Week Boot Camp which will be available to book onto very soon. You can check all Upcoming Events here. Perfect: When you know which internships you want to apply for, you might want to book in for an Applications Appointment to make sure your application documents are competitive with other applicants’. Apply: You will only be able to apply for these opportunities through the York St John Jobs and Opportunities website. If you are not already signed up, register now. Each employer will receive a shortlist of the best applications for their role. They will then invite York St John students and graduates to interview. Prospective interns should know if they have a place on the scheme by mid-May, so please bear this in mind when making holiday plans. Once the employer has made an internship offer and you have accepted that offer, York St John Careers will send both you the intern, and the employer, an agreement letter each to fill in and return to York St John. Please note that funding for the internship will not be released to the organisation until these completed letters are returned. The proposal form we will ask all companies to complete about their vacancy will ask the question of whether they already have a student or graduate in mind to hire. If the company and the internship proposed meet our criteria, the internship will be reserved funding without having to be advertised.